Consider a circuit in which a battery of emf is connected in series with an inductor of inductance and a resistor of resistance . For obvious reasons, this type of circuit is usually called an circuit. The resistance includes the resistance of the wire loops of the inductor, in addition to any other resistances in the circuit. specified by Ohm's law. Note that, in a steady-state, or DC, circuit, zero back-emf is generated by the inductor, according to Eq. (243), so the inductor effectively disappears from the circuit. In fact, inductors have no effect whatsoever in DC circuits. They just act like pieces of conducting wire. Figure 46: An circuit with a switch. Let us now slightly modify our circuit by introducing a switch. The new circuit is shown in Fig. 46. Suppose that the switch is initially open, but is suddenly closed at . Obviously, we expect the instantaneous current which flows around the circuit, once the switch is thrown, to eventually settle down to the steady-state value . But, how long does this process take? Note that as the current flowing around the circuit is building up to its final value, a non-zero back-emf is generated in the inductor, according to Eq. (243). Thus, although the inductor does not affect the final steady-state value of the current flowing around the circuit, it certainly does affect how long after the switch is closed it takes for this final current to be established. after the switch is closed (since ). By the time , the current has risen to more than of its final value (since ). Thus, is a good measure of how long after the switch is closed it takes for the current flowing in the circuit to attain its steady-state value. The quantity is termed the time-constant, or, somewhat unimaginatively, the L over R time, of the circuit. Figure 47: Sketch of the current rise phase in an circuit switched on at . Suppose that the current flowing in the circuit discussed above has settled down to its steady-state value . Consider what would happen if we were to suddenly (at , say) switch the battery out of the circuit, and replace it by a conducting wire. Obviously, we would expect the current to eventually decay away to zero, since there is no longer a steady emf in the circuit to maintain a steady current. But, how long does this process take? According to the above formula, once the battery is switched out of the circuit, the current decays smoothly to zero. After one time (i.e., ), the current has decayed to of its initial value. 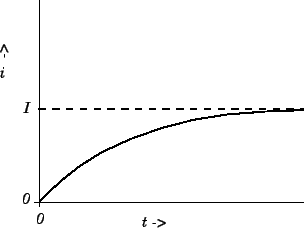 After five times, the current has decayed to less than of its initial value. We can now appreciate the significance of self inductance. The back-emf generated in an inductor, as the current flowing through it tries to change, effectively prevents the current from rising (or falling) much faster than the L/R time of the circuit. This effect is sometimes advantageous, but is often a great nuisance. All circuits possess some self inductance, as well as some resistance, so all have a finite time. This means that when we power up a DC circuit, the current does not jump up instantaneously to its steady-state value. Instead, the rise is spread out over the time of the circuit. This is a good thing. If the current were to rise instantaneously then extremely large inductive electric fields would be generated by the sudden jump in the magnetic field, leading, inevitably, to breakdown and electric arcing. So, if there were no such thing as self inductance then every time we switched a DC electric circuit on or off there would be a big blue flash due to arcing between conductors. Self inductance can also be a bad thing. Suppose that we possess a fancy power supply, and wish to use it to send an electric signal down a wire. Of course, the wire will possess both resistance and inductance, and will, therefore, have some characteristic time. Suppose that we try to send a square-wave signal down the wire. Since the current in the wire cannot rise or fall faster than the time, the leading and trailing edges of the signal get smoothed out over an time. The typical difference between the signal fed into the wire (upper trace) and that which comes out of the other end (lower trace) is illustrated in Fig. 48. Clearly, there is little point in us having a fancy power supply unless we also possess a low inductance wire, so that the signal from the power supply can be transmitted to some load device without serious distortion. 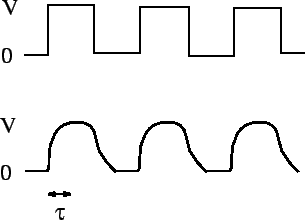 Figure 48: Typical difference between the input wave-form (top) and the output wave-form (bottom) when a square-wave is sent down a line with finite time, .